These are construction paper hearts Andrew and I made to hang in our front window. 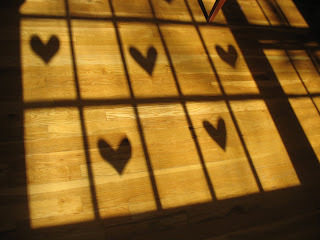 I just loved the shadows the late morning sun created on our floor filling our home with love. 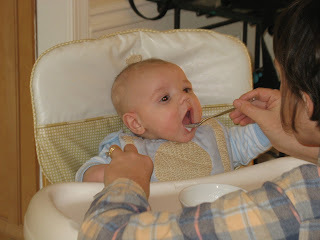 Lately Adrew has been noticing (and pointing out) that Jay puts a lot of things to and into his mouth. (i.e., toys, books, his toes, Mommy's necklace, etc.) Whenever he sees Jay do this he says, "Jay eat it." OR "Jay eating it." 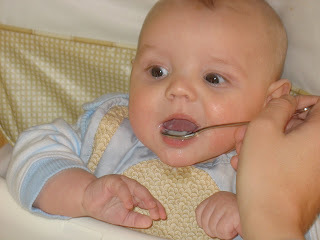 Today, Jay made his first attempt eating something other than his toes. 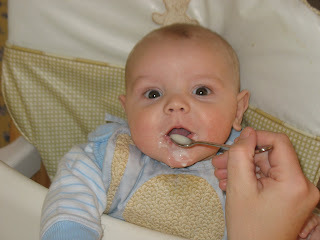 He had his first taste of rice cereal today and seemed to like it.